Receive a FREE Heart’s Treasure Pendant! Come in and take a look around at the Bead Bazaar, and let us help you with those special Valentine’s Gifts you would like to make! 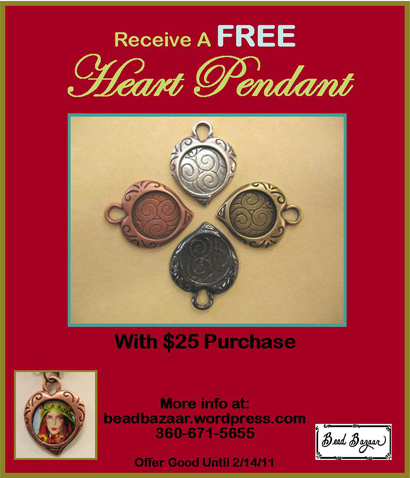 With your $25 purchase, you will receive a FREE heart pendant! Offer good until February 14, 2011 or while supplies last. These charming pendants feature a 12mm bezel setting, making them ideal for framing whatever you’d like to wrap your heart around. Inspired by vintage romance, these pendants are available in an array of antiqued metals, including brass, black, antiqued silver, and copper. Use them as an open locket or frame a whimsical collection of beads; these versatile pieces offer endless design ideas! The Bead Bazaar has a fun selection of love themed pieces, perfect for Valentine’s day. Heart shaped charms can be found both in sterling and base metal options. Indulge in the luxe hues of Swarovski crystal hearts in siam, fushia, rose, and others! Heart shaped chain can be a fun alternative to a traditional pendant. Want to add a romantic touch to your jewelry without using the traditional heart shape? Take a look at our over-sized pearls, keys and locks, and antiqued filigree pieces, just to name a few options, or you can spell out a creative Valentine with our alphabet beads. Personalize a Valentine charm with our Vintaj blanks and alphabet punch set. Whatever your style, we’re sure to have the components for the perfect Valentine piece. Be sure to drop by before February 14th for your FREE heart pendant (with $25 purchase) and show us what you’d like to wrap your heart around. We’ll be seeing you soon! January’s Special~ Red Tag SALE at the Bead Bazaar! Save up to 60% off selected merchandise during the Bead Bazaar’s Red Tag Sale, now through January 31st! Spring cleaning at the Bead Bazaar means savings for you as we discount selected merchandise up to 60% off! Sale stone strands range from 25% to a whopping 50% off, including beautiful gems like Larimar, Malachite, Charoite, Citrine, Pyrite, Labradorite, Moonstone, and more! With such a fine selection, who can resist? Many of our front case items are 30% off, including larger pendant sized stones and uniquely carved natural pieces. Also found among our 30% discounted case items are select sterling charms, sterling beads, and sterling findings, making now the time to indulge in unique and decorative silver pieces. All sterling core interchangeable Pandora-style beads are also 30%0ff. With their price reduced from $7.99 to $5.60 each, these trendy beads are more affordable than ever! Create a sweet spring look with select glass pearl and floral glass strands at 25% off. Other discounted glass strands are up to 50% off, including some Czech styles. Vintage glass pieces are a unique choice for any jewelry design, and at 60%off, they are quite affordable one of a kind elements. Don’t forget to take advantage of our post-Christmas sale: 60% off Christmas themed items (not including snowflake frames). Make sure to stop by the Bead Bazaar before January 31st. We promise that you don’t want to miss this sales event! Customers are already discovering new beads at terrific prices; we hope to see you soon!